A tutorial on Image-based Visual Servoing (IBVS) with a multicopter. RAS, the robotics group at QUT, is hosting a Winter School for students interested in Robotics and Autonomous Systems. During the event, a number of demos and practical sessions will be run, see the school web page for the schedule. The aim of this practical session is to provide you with some hands-on experience in applying some simple computer vision and robotics techniques to a flying robot. 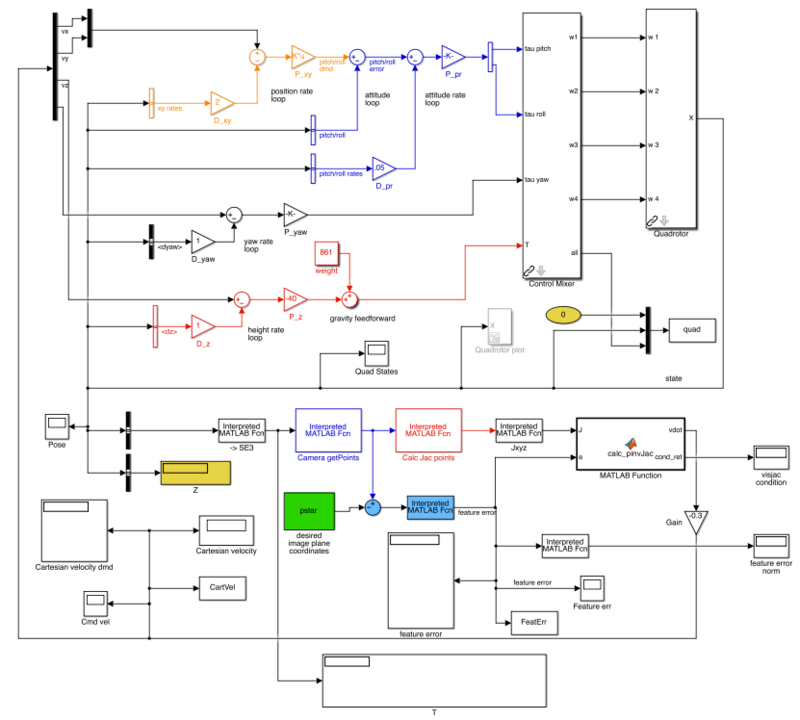 This will involve developing an IBVS with quadrotor simulation with MATLAB Simulink. 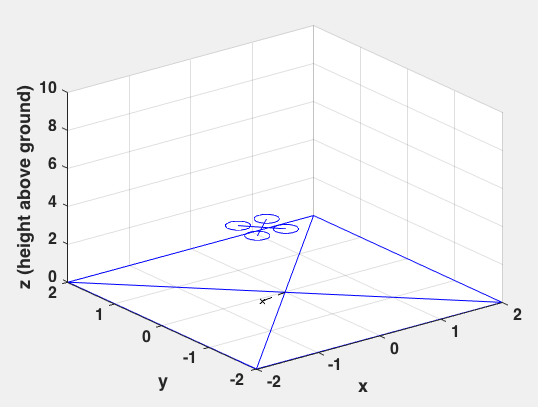 The task is simple that the quadrotor flies to a goal pose given four world points. IBVS tries to minimise error in an image coordinate, and this yields the flyer approaches the target. We set up a downward facing perspective camera for image measurement, and the quadrotor simulation model provides 12 states (i.e., position, orientation, linear and angular velocities for each axis). IBVS produces desired velocities for four degree-of-freedoms (x,y,z, and yaw) and these are fed to a quadrotor model. Step1. Download the below and create a workspace folder, e.g., “WinterShcool2015_IBVS”. Step2. Move downloaded zip files to the workspace folder and extract them. You should see three folders named “small_rvctools”, “Simulink_template”, and “MATLAB_template”. Solution files will be uploaded after the practical session.